For those of you who have read my lists you know one thing for certain: I absolutely love Kona Café. It is my favorite restaurant in all of Walt Disney World for quite a few reasons, one of which includes my favorite dish, the Pan-Asian Noodles. Kona Café’s chefs take ordinary Ramen noodles and transforms them into a gourmet, veggie-filled dish sure to please those tangy taste buds of yours. 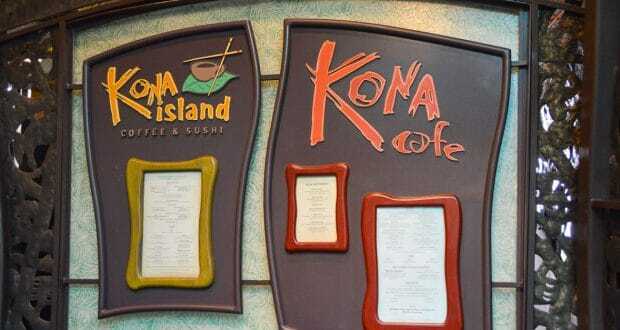 Whatever delicious dish you choose to order, you’ll be sure to enjoy your Kona Café dining experience! Recently, I had the pleasure of enjoying sushi with my dinner at Kona Café. Before chowing down my favorite Pan-Asian Noodles, I ordered the Cucumber roll, complete with wasabi, pickled ginger, and soy sauce for dipping. I’m not sure if this is just part of the magic of Disney, but this was the best sushi roll I have ever eaten. The flavors combination of the rice, wrap, and selection of carrots, avocado, and cucumber made this appetizer-sized sushi roll one to be sure to come back for on my next trip! We all love restaurants that supply our table with endless bread and butter to share, but if you have not had the pleasure of eating Kona Café’s macadamia nut butter and Hawaiian bread, you are definitely missing out. This sweet loaf of bread will have your mouth watering before you even break into it. Kona’s made in-house, macadamia nut butter complements the sweet bread for the ultimate pre-meal treat. This is not a joke: I dream about this coffee. The 100%, French-pressed Kona coffee is imported straight from Hawaii, where the beans are harvested roasted to perfection. At Kona Café, the coffee is served in the French press, where it is made fresh for each coffee lover. Though a two-serving pot of coffee can be enjoyed for less than $10. I can guarantee it’s worth the taste. Disney’s Polynesian Resort recently underwent some major modifications. The entire lobby and much of the grounds were transformed to look even more like an authentic resort you would find on the Hawaiian Islands. Complete with new décor and an updated island vibe, the Polynesian Resort is definitely a must-visit resort on Disney property. Kona Café was not part of these renovations, as its décor still goes along with the Polynesian theme, but the chill, island feel of the lobby is felt in and around the open restaurant. Hello, my name is Alexandra Blazevich and I am a 22 year old journalist. Put quite simply, I am a Disney addict. I am originally from Cary, North Carolina, a small town just outside of Raleigh. In 2013, I moved to Orlando, Florida to dance with The Orlando Ballet, pursuing my childhood dream of becoming a professional ballet dancer- but I spent all my free time either in Disney World or thinking about it. Now, I am a senior at UNC-Chapel Hill and write for a various publications, but Disney will always be my favorite subject to write about.